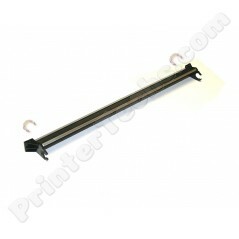 Transfer guide, with white bushings included, for HP LaserJet 8100 8150 series. Reference HP part# RF5-2676 , RB1-6441. This part clips onto the transfer roller ; it is a common replacement part when the bushing/retainer breaks. Transfer guide, with white bushings included, for HP LaserJet 8100 8150 series. Reference HP part# RF5-2676 , RB1-6441. This part clips onto the transfer roller; it is a common replacement part when the bushing/retainer breaks.